A luxury lodge and spa set in a private wilderness reserve in the Cederberg area of Western Cape. Bushmans Kloof is a place where luxury and nature combine offering the ultimate in get away from it all wilderness experience. The reserve is a haven for conservation with many species of endangered fauna and flora living here. 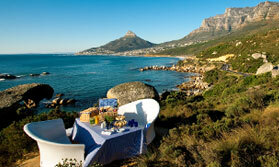 It is one of South Africa's Natural Heritage Sites and is part of the Cape Floral Kingdom too. From June to October, spring flowers flush the landscape with colour. Rock formations here are stunning and the views and scenery all around are amazing. Within the hills are over 130 San Bushman rock art sites and guided walks to these sites are one of the attractions here. Activities are included in your stay here and consist of nature drives, walks, bushman art site visits, swimming in rock pools, fly fishing, canoeing, mountain biking. A favourite is the sundowner drive, where you enjoy learning about nature of the reserve and seeing some of the Cape's most endangered animals from a 4WD vehicle, then stopping at a scenic spot with drinks to watch the sun go down. The main lodge has a mix of luxury rooms, deluxe rooms and suites. Rooms are luxurious appointed in a mix of traditional colonial and African fixtures and fittings. All have air conditioning, ceiling fans, underfloor heating, mini bar, safe, tea and coffee unit, bath robes and pampering toiletries. Koro Lodge is a private villa accommodating up to 10 people, which operates independently of the main lodge, though guests here have the use of the lodge's facilities. This is a Relais and Chateaux property and as such the dining is of a very high standard. The best local fresh ingrediants are used to create gourmet cuisine and beautiful grilled dishes. Meals are served in the homestead, on the patio terrace (usually breakfast and lunch), outdoor on the boma deck and in room if you choose. The spa at Bushams Kloof has been recently refubished and includes a Crystal Steam Room, 5 treatment rooms and gardens where the benefits of hydrotherapy can be enjoyed. There is also a separate Spa Gazebo in the grounds, where guests can indulge in massages and touch therapies whilst enjoying panoramic views of the gardens. The centrepeice of the Crystal Steam Room is a solid block of Rock Quartz Crystal, renowned for its healing and purifying properties. It also regulates energy and helps draw out negative energies. In the spa gardens guests can swim in the rock pools and natural waterfalls abd enjoy the positive effects of water therapy, which include stimulating blood circulation, boosting the immune system, aiding digestion and reducing pain sensitivity. It also helps to release tight muscles. Body wraps and steam treatments are also available. After and between treatments guests can relax in the tranquility lounge. There is health bar serving snacks and rooibos tea. Bushmans Kloof has a fitness centre, 4 swimming pools and an outdoor jet pool. Open: Bushmans Kloof is open all year. Location: Bushmans Kloof is in the Cederberg region of the Western Cape, in the foothills of the mountains. It is about a 3-4 hour drive from Cape Town. Rooms: There are 16 rooms and suites plus Koro Lodge, a private villa, and can accommodate a maximum of 34 guests in total. All rooms and suites are air conditioned, have ceiling fans and underfloor heating. Facilities include a minibar, tea and coffee maker, safe, IDD phone, TV, free Wi-Fi and en-suite bathroom with a range of toiletries and bathrobes. Rooms come in 2 categories, luxury and deluxe, the latter offering a little more space, and there is a family deluxe room. There are 2 suites, Paterson in the main manor house with a lounge and private terrace, and the Riverside Supreme Suite with similar facilities and a heated swimming pool. Koro Lodge is the original farmhouse, redesigned to offer accommodation for groups of up to 10 people. It operates independently of the main lodge and comes with a chef and a guide. It has 2 en-suite master bedrooms, a loft that sleep up to 4 children and a family area that can sleep 2, and an additional bathroom. There is an open plan living, dining and bar area, a fully fitted kitchen and a small library. Interiors are air conditioned and there are ceiling fans and underfloor heating. The villa has a TV, IDD phone and free Wi-Fi. Outside there’s a terrace with a braai (barbecue) and an infinity pool. Activities: Bushmans Kloof offers guided tours of the reserve showcasing the flora and fauna, and opportunities to explore independently on foot and by bike following the main trails, as well as canoeing and swimming in pools. Other activities available include fly fishing, croquet and archery. This area is known for its Bushman rock art and there are over 130 sites near the lodge you can tour with a guide, plus a heritage centre where you can learn about bushman culture. The Clanwilliam Museum near the lodge is dedicated to the area’s Voortrekker history. Staff can arrange a number of local excursions. Activities at the lodge include yoga sessions and wine tasting. Facilities: The lounge at the main lodge features a large screen TV, and there is a collection of books you can browse through, plus wildlife DVDs you can watch. The spa offers a wide range of health and beauty treatments and personalised programmes can be developed for individual guests. It is open daily from 08:00 till 20:00. The lodge is set in well-maintained gardens which include a swimming pool. Dining: There are 3 dining venues at the main lodge: the Homestead, Makana and Embers. The Homestead is the main restaurant, specialising in fine dining, Makana offers indoor and outdoor meals in a more casual atmosphere, and Embers is a traditional boma experience, eating by the camp fire out in the open. Meals are eaten at individual tables and private dining can be arranged. Koro Lodge has its own chef and all meals are taken at the villa. There is an extensive wine list. Children: Children aged 8 years and over are welcome at the main lodge. There is no minimum age limit for Koro Lodge. Communication: There is complimentary Wi-Fi internet access throughout the main lodge and at Koro Lodge. There is no mobile phone reception.